Hibs leapfrogged Falkirk into third place in the Championship with a comfortable 3-0 victory over Queen of the South at Palmerston Park this afternoon. Head Coach Alan Stubbs made two changes to the starting XI that drew with St Mirren at Easter Road last Saturday. Liam Fontaine missed out with a minor injury and was replaced by Darren McGregor and goal-scorer Martin Boyle dropped to the bench with Dominique Malonga joining Jason Cummings (pictured) up front. New signing Jamie Insall was listed amongst the substitutes alongside ex Queen’s winger Dan Carmichael, however there was no place in the squad for Farid El Alagui who scored in a closed door game against Dundee in midweek. 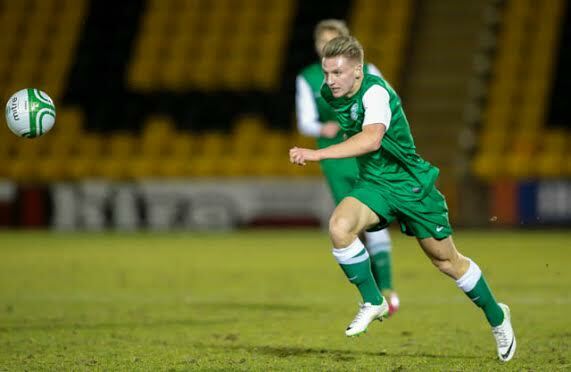 Hibs’ on-loan winger Alex Harris was not allowed to play against his parent club but former Hibs striker Paul Heffernan was amongst the Doonhamers subs. The Easter Road side started brightly and opened the scoring in the third minute when Cummings latched onto a Lewis Stevenson pass and prodded the ball home from short range, to the delight of the large travelling support. Hibs then dominated possession and played some neat football although Queen’s looked dangerous on the break. John McGinn had a goal-bound effort deflected off Darren Brownlie for a corner before Hibs added a second just before the break when Dylan McGeouch was fouled whilst passing to Malonga. The referee allowed advantage and Malonga was able to hold the ball up before finding Liam Henderson who slotted the ball into the net from 12 yards for his third goal in four games. Lewis Kidd was booked for a bad challenge on Mark Oxley after the keeper cleared the ball then Cummings was shown a yellow card after preventing a quick free kick being taken. With 20 minutes remaining Cummings was lucky to avoid a red card after a reckless challenge on Jason Higgins but Greg Aitken decided a warning was sufficient. Two minutes later Boyle replaced Cummings and Heffernan replaced Mark Millar. Hibs looked happy to control the proceedings as Queen of the South tried to get back into the game without creating any clear-cut chances. In the 75th minute John McGinn fired a 30 yard free kick against the crossbar however that was to be his last act on the pitch before being replaced by Carmichael. Oxley was spoken to by the referee for time wasting then Sam Stanton replaced goal-scorer Henderson who left the field to a standing ovation from the Hibs’ fans. Hibs added a third in the final minute when Stevenson picked up the ball in midfield, sprinted half the length of the field then crossed the ball into the path of Boyle who fired the ball into the net to round off a good day for the club. Stanton almost made it 4-0 in time added on after good work by McGeouch but the Queen’s keeper produced a fantastic save. Elsewhere Rangers beat Falkirk 3-1 at Ibrox whilst Raith Rovers beat Morton 2-1. These results mean that Hibs sit third on 16 points, two points behind Raith Rovers with a game in hand. Rangers have won their first nne games and have 27 points. Hibs: Oxley, Gray, Hanlon, McGregor, Stevenson, Bartley, McGinn, Henderson, McGeouch, Cummings, Malonga. Subs: Stanton, Insall, Boyle, Carmichael, Reguero, Dunsmore, Shaw. Much was expected of Paul Hefferman at one time.